Newly transplanted day lilies (Hemerocallis spp.) establish quickly, producing lush, swordlike spring and summer foliage punctuated by bright summer flowers. 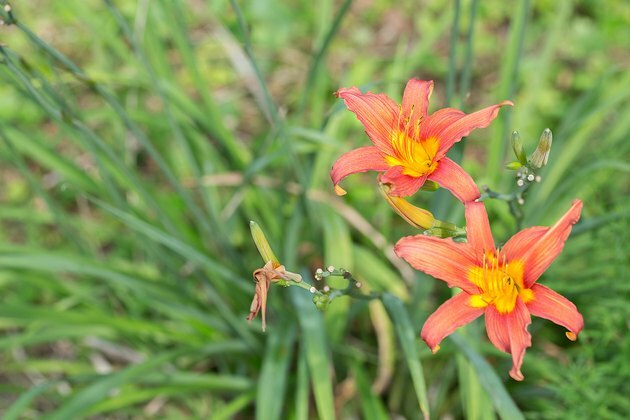 Day lilies grow in U.S. Department of Agriculture plant hardiness zones 3 through 10, depending on the variety. 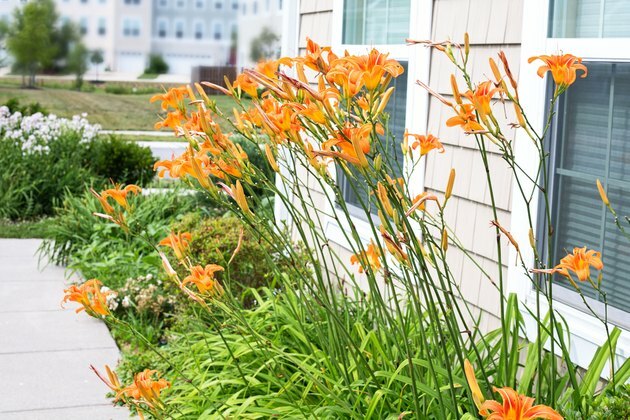 Whether you are transplanting new day lilies or dividing and transplanting those you already have, doing so at the right time ensures you still get to enjoy healthy plants and a full season of flowers. New day lily plants establish quickly when planted in spring, but you can plant them any time between spring and late summer. Potted plants can survive without immediate planting if you provide them with full sun and keep the soil moist. Day lilies bought as bareroot plants that aren't packaged in soil need immediate transplanting so the roots don't dry out. Trim off the top one-third of the foliage with shears wiped with a cloth soaked in rubbing alcohol before transplanting. Digging and transplanting on a cloudy day or in late afternoon prevents heat and sun stress on newly moved plants. Although existing day lily plants tolerate digging and transplanting any time during the spring and summer, the best time to dig in in early spring just as they begin putting on new growth, or in summer right after they finish their first flush of flowering. The plants require digging, dividing and transplanting every three years, or when the clumps get too large and the plants begin flowering poorly. Cutting back the leaves to 6 inches tall prevents breakage when you dig them up. 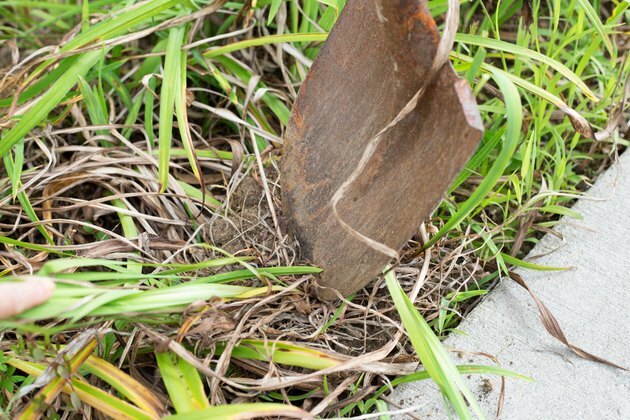 Loosen the soil around the perimeter of the root zone with a spading fork and slide the fork underneath the roots, lifting the day lilies from the ground. Split the lifted clump into sections, with four leaf fans on each section, before transplanting. Garden beds that get full, all-day sun with well-draining but moist soil provide healthy growing conditions for your day lilies. 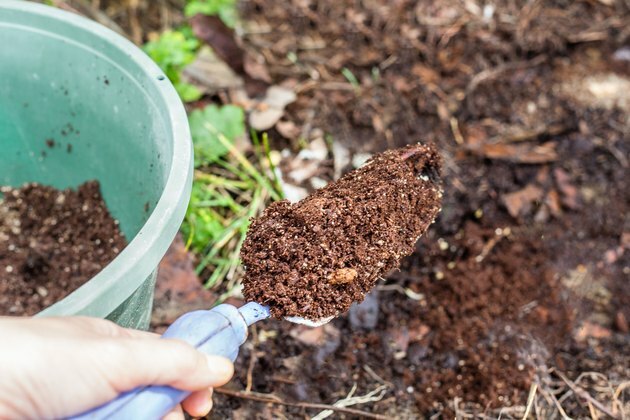 Mixing in a 2- to 4-inch layer of compost into the top 8 inches of soil improves the soil. Plant new or divided transplants in a hole about the same depth as the root ball, so the crown of the plants sits just at the soil surface, and then fill in the hole with soil. Creating a mound of soil in the bottom of the hole allows you to spread the day lily roots out in the hole so they can establish well. Space the plants about 18 inches apart to prevent overcrowding. A deep watering right after transplanting helps the soil settle around the roots. After watering, cover the soil with a 2- to 3-inch layer of bark or pine straw mulch, leaving 1 to 2 inches between the mulch and the base of the plants. Mulch helps retain moisture and insulates the soil, while also smothering and preventing weed growth. Water day lilies once each week, soaking the soil 8 inches deep. 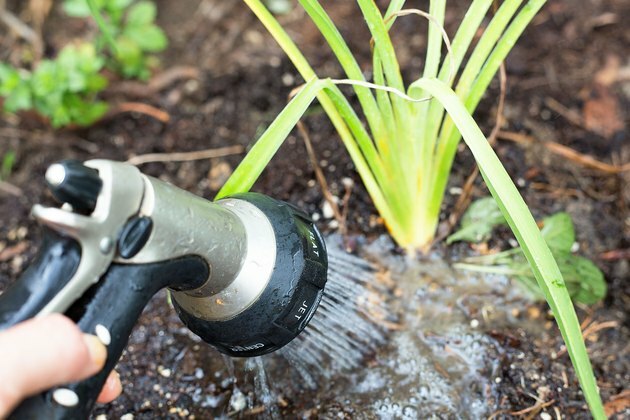 You can trim off any tattered or damaged leaves with disinfected shears to improve the appearance of the day lilies as they establish.